As anyone who has paid any attention at all knows, after an amazing multi-year run of prosperity, farming is undergoing tougher times with the prices of ag commodities down substantially in the last few years. For example, after topping out around $8.00 a bushel in 2012, the corn futures price has recently plumbed new lows in the $3.20’s. As the article states, this has potential implications for Deere (DE), Potash (POT), and Monsanto (MON). Here is the corn futures chart from Finviz. One of the main drivers of the corn boom of the last decade has been the increasing ethanol mandates. But, with refiners bumping up against the 10% blend wall, it is hard to see a lot of upside in demand from here. This Fall’s expected bumper crops have driven down the price of corn, but who knows what next year’s weather holds. So the current price decline is likely overdone. In the long term, expected growth of the world population should give farming a strong tailwind. 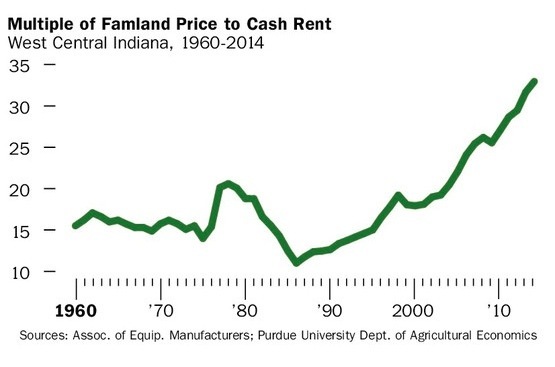 Something that would give me pause is the following chart showing the historical farmland price to cash rent ratio. As Barron’s points out, current land prices look pretty rich by that measure. Farmland selling at a 77% valuation premium to its 50-year average seems hard to justify. But this data is only for Central Indiana. By my back of the envelope calculations using data from Iowa State University’s website Ag Decision Maker, multiples in Iowa seem similarly elevated. Comparing the estimated statewide average value for “Medium Quality Farmland” of $8,076 an acre (September 2014) with their statewide average of $260 an acre cash rent (May 2014) gives a multiple of about 31. No matter how you slice it, this seems expensive to me given rising production costs and low commodity prices. Still, holding is fine if you are a farmer and your balance sheet lacks debt so you can handle a downturn, as your holding period may approximate forever. But, absent a substantial and rapid bounceback in commodities prices that could drive further cash rent growth I have a hard time seeing how you make farmland work as an investment from current price levels. I see little reason to be a buyer of farmland here given fundamentals, valuation, and the potential for higher interest rates. And unless your time horizon is nearly infinite, it seems likely to be a good time to consider lightening up. It’s hard to have many illusions about the conflicts of interest and shady dealings of the brokerage industry if you’ve been paying attention for a long time like I have. But you tend to think the worst offenders have New York or Long Island addresses like Jordan Belfort’s Stratton-Oakmont, of Wolf of Wall Street fame. But wait! The spirit of the boiler rooms lives — in Iowa of all places (h/t Josh Brown). Now comes the news from Dealbook that Berthel Fisher & Company, based in sleepy Marion, Iowa, is the latest trailblazer in screwing over its clients. Not only have they sold lousy private placements to their unknowing customers, but they have had the nerve to countersue them to intimidate them! Not even the New York firms have had the chutzpah to try this tactic before. If Berthel succeeds in this gambit, it will basically mean that brokerage firms can get away scot-free with any abuse of their customers, suitability standard or not. The brokers they have sued are suing them back, accusing them of reneging on indemnification agreements. The practice, which can intimidate investors already reeling from investment losses, is not widespread. About half of the at least two dozen scattered examples come from one brokerage firm — Berthel Fisher & Company, based in Marion, Iowa. Berthel Fisher seized on the language in those documents to bolster two counterclaims against 32 investors from Midwestern states who had lost all of the money they had invested in a private placement in a cellphone company. Berthel won both cases last year. The investors said they had been pitched the product by Berthel brokers who had an obligation to sell them a suitable investment. In their complaints filed with Finra, they contend that Berthel employees told them the investment was a ‘sure thing,’ ‘no lose’ and carried little risk. In February, Finra fined Berthel $775,000 for supervisory failures related to its sales of alternative investments. Among Finra’s findings was that Berthel had not enforced suitability standards for sales of some of its alternative products. One of the firm’s brokers, described but not identified in the settlement with Berthel, is in prison for stealing money from his clients. Mr. Peiffer’s firm is representing an investor who did business with that broker. The video intro to Berthel’s website talks the talk of integrity and they use the well-loved former coach of the Iowa Hawkeye football team, Hayden Fry, to convince people they will be good stewards of their money. A reminder: really good con artists don’t seem like con artists. If you can fake integrity, you can go a long way if you are morally ambiguous. At least until people catch on. Next, if you deal with an advisor, insist that they have a fiduciary standard of care, not the mere “suitability standard” of brokerage firm reps. Or do it yourself through an organization with low fees and integrity like Vanguard. And, for God’s sake, if you have money with Berthel, get out while the getting is good. An organization with no integrity is not a good steward of your money. With all of the unrest and conflict in the world today, the news seems to be an ever-growing miasma of negativity. It is easy to get lost in hopeless resignation or casting blame on others for all of the problems. It seems this is where many if not most people stay stuck. A constructive approach requires seeking solutions instead of just wallowing in negativity. But before you can seek solutions, you must see things as they are, and not as your prejudices and illusions make them appear. Kent Thune, The Financial Philosopher, has a great post addressing the dysfunction in the world and the blindness of most to the causes thereof. Thune sees most people as being unconscious minds cut off from reality by confirmation bias and ego. We don’t see reality as it is because it is easier to scapegoat the other party or some other group for all of the world’s problems. We tend to seek out the extreme voices that gibe with our worldview. These people are paid to gin up controversy. Talk radio, MSNBC, Fox News, etc. They are incentive-caused bias writ large. Their incentives for higher ratings run exactly counter to the best interests of the country. They paint radically different pictures of the world that are at best illusions and at worst lies. These different pictures are incompatible with one another and lead directly to our poisoned culture. Broken Political System: Politicians today do not get elected based upon the substance of their ideas but on the effectiveness of their illusions. Money does not win elections; money buys higher quality illusions in greater quantities. In a world of illusion, the best illusionists rule. The individuals best suited to serve in government may not even run for office because they refuse to play the deceptive game. This has always been true to some degree but more so with today’s information technology. The politics of lies and illusions is what we are left with. You almost can’t be elected as a non-extreme problem solver any more, and the few in office should be put on the endangered species list. And it isn’t the politicians fault. The politicians we have are a product of all of us as voters. We want people in office who represent our own distorted view of reality. As Kent says above, “We fail to listen because the ego only listens to respond.” The problem isn’t another party or group, we are all a big part of it until we shed our own self-serving and distorted views. This is the prerequisite to solving problems, rather than just impotently lamenting how the world seems to be going to Hell. Like it or not, we are all in this together. Let’s sacrifice our egos and illusions to get connected with reality and start solving some of our problems.